Sometimes going back is the best way to start over Candy shop owner Charlotte Caine knows temptation.To reboot her life, shed weight and gain perspective, she's passing up sweet enticements left and right. But willpower doesn't come so easily when hell-raiser Spencer Gregory comes back to Hope's Crossing, bringing with him memories of broken promises and teen angst. A retired pro baseball player on the mend from injury--and a damaging scandal--he's interested in his own brand of reinvention. Now everything about Spencer's new-and-improved lifestyle, from his mission to build a rehab facility for injured veterans to his clear devotion to his preteen daughter, Peyton, touches Charlotte's heart. Holding on to past hurt is her only protection against falling for him--again. But if she takes the risk, will she find in Spencer a hometown heartbreaker, or the hero she's always wanted? RaeAnne Thayne finds inspiration in the beautiful northern Utah mountains, where she lives with her husband and three children. Her books have won numerous honors, including three RITA Award nominations from the Romance Writers of America and a Career Achievement Award from RT Book Reviews magazine. 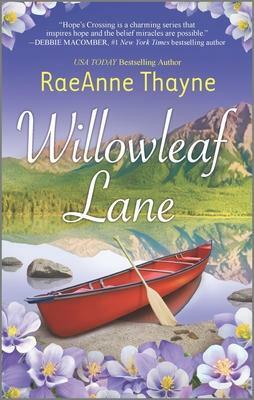 RaeAnne loves to hear from readers and can be reached through her website at www.raeannethayne.com.